THPR45 - Aluminum 64-P setscrew spur gear & pinion [THPR45] - $9.79 : TSR Slot Cars, TSR Slot Cars - Dedicated to Slot Car racing, collecting, restoration, track design, electronics and software. 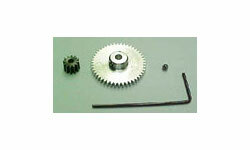 Aluminum 64-P setscrew spur gear / steel pinion gear ratio 14-45.Will fit sidewinder Fly and GB-Track cars for a much smoother gear setup. Must be used with THP2404 axle.